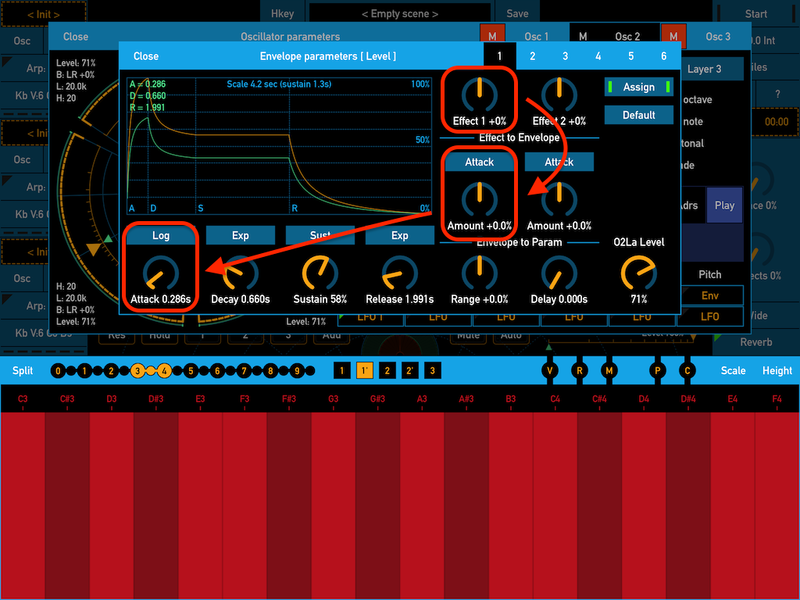 The new version 1.3 of SynthScaper - Soundscapes synthesizer has been released. 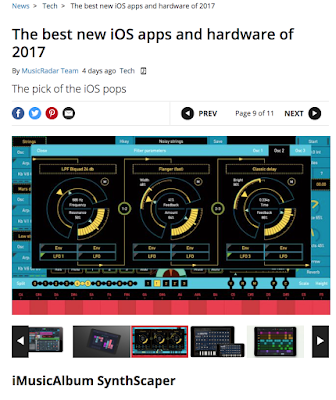 In this update added a new tool Designer (only for iPad, for iPhone in the next update) that is intended to automatically generate and tweaking new presets and scenes. With using neural network the Designer generates new presets based on already existing by adding some random variations and checking the result so that the new preset remains similar to the selected pattern. Therefore new presets and scenes always will be different but remain similar to existing ones and in most cases are ready to use, possibly with a small adjustment of some parameters. Even if the result is not entirely suitable for your purposes, the designer is the great tool for creating a starting point that can easily be finalized as you would like. 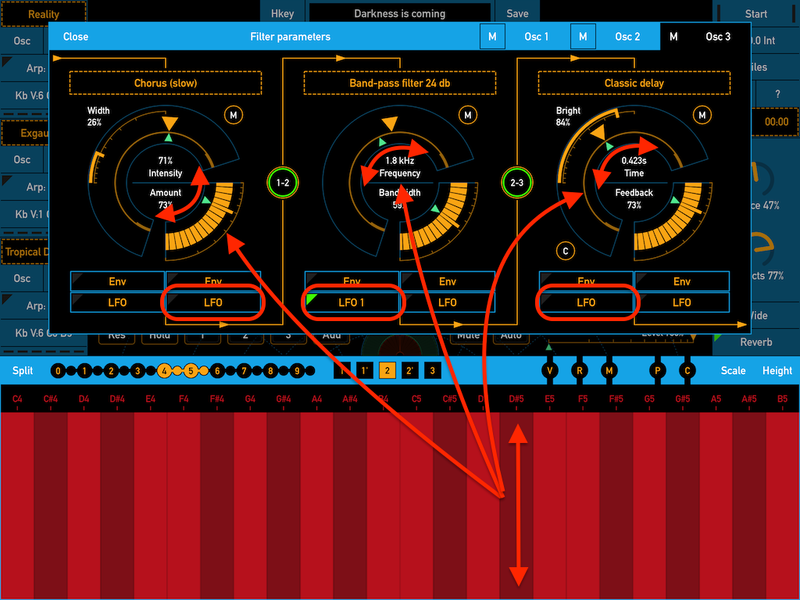 Also in this update - New scenes, presets and samples, Audiobus SDK updated, Built-in description updated, Minor bugs were fixed. Designer is a tool intended to automatically generate and tweaking new presets and scenes. With using neural network algorithms the designer generates new presets based on already existing by adding some random variations and checking the result so that the new preset remains similar to the selected pattern. 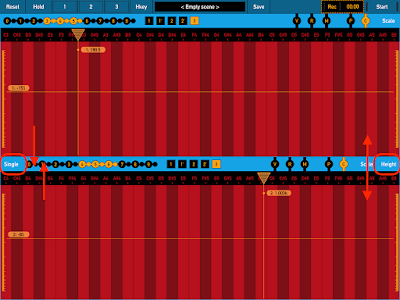 The panel "Designer" contains all needed controls for selecting pattern of the new presets and for tweaking them after generating. The left part of this panel contains controls for generating presets. At the top there is selector of the samples that will be used in new presets. It could be any samples from built-in or user libraries or from defined group or you can select a specific sample. Tap to the dashed area to select specific group or sample. 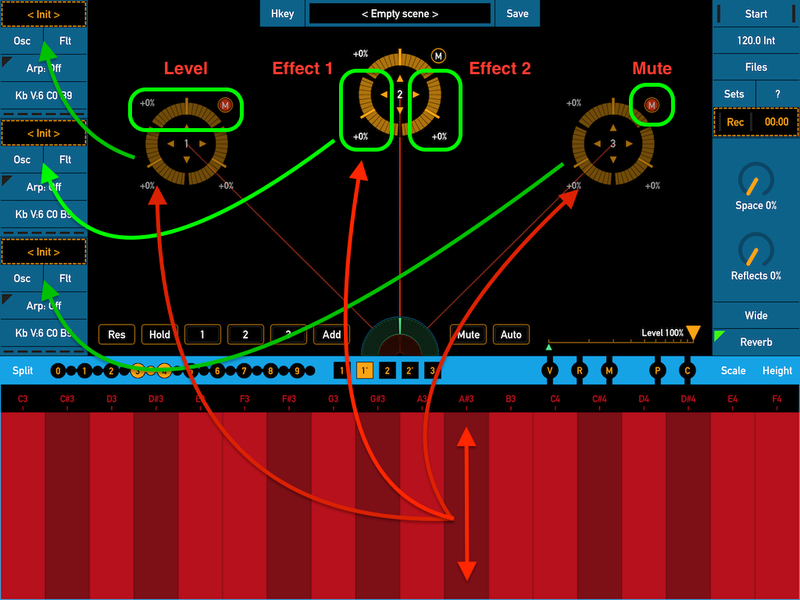 Below there are four controls for selecting pattern of the new preset. Two controls select pattern of oscillator section and two for filters. 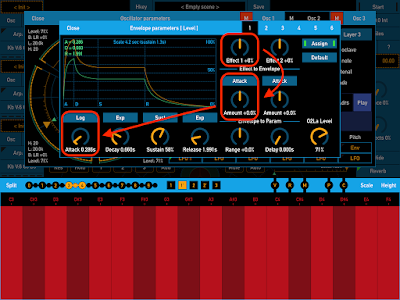 So you can use different patterns for oscillator and filters in new preset. Control "Complexity" selects the pattern based on complexity of existing presets. The complexity increases from the bottom up. 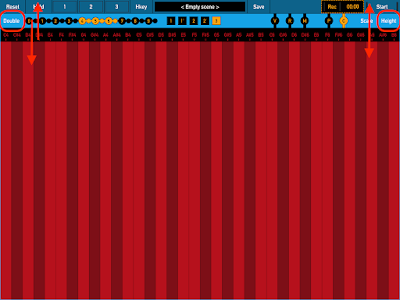 Control "Variety" sets a level of variations from the base pattern. The higher this level the more diverse presets will be creating. 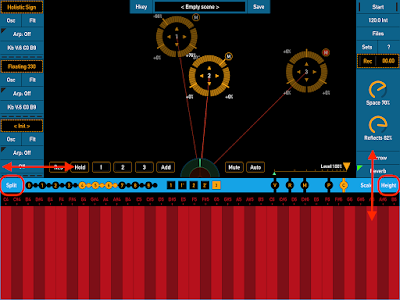 The basic idea behind these controls, as well as the entire application, is the experiment. Just try different combinations and listen to the result. SynthScaper - Synthesizer for iPad and iPhone specially designed for creating and experiments with ambient soundscapes in wide range from noises to melodic instruments and everything in between. 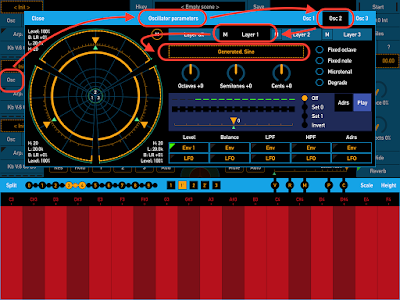 FieldScaper - Sound warp field recorder and scapes constructor ver. 1.8 has been released. 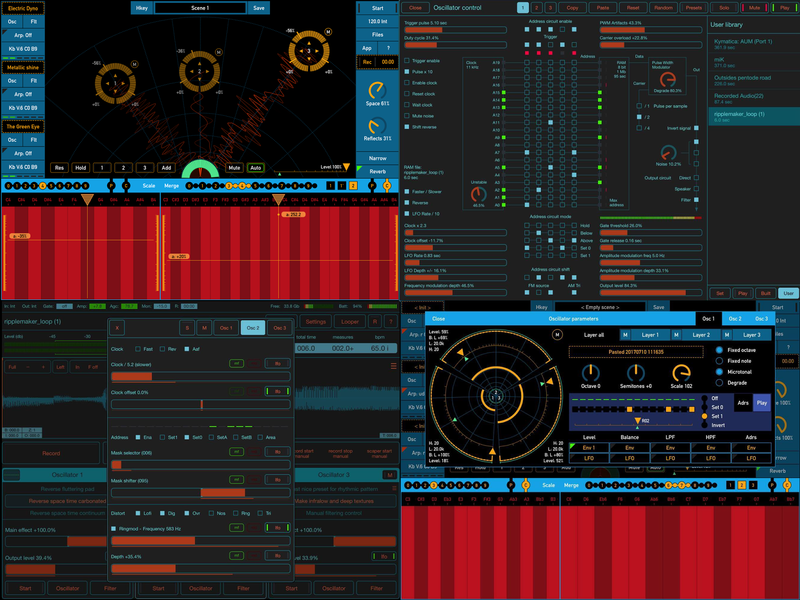 Added support of Ableton Link. Added support of Audiobus 3. Added support of Audiobus MIDI. New mode "Manual" in the looper. Sync start with Ableton Link. The minute ambient intro to the piece features SynthScaper. Makes me think of Lake Erie right after sunset. Release early next year. 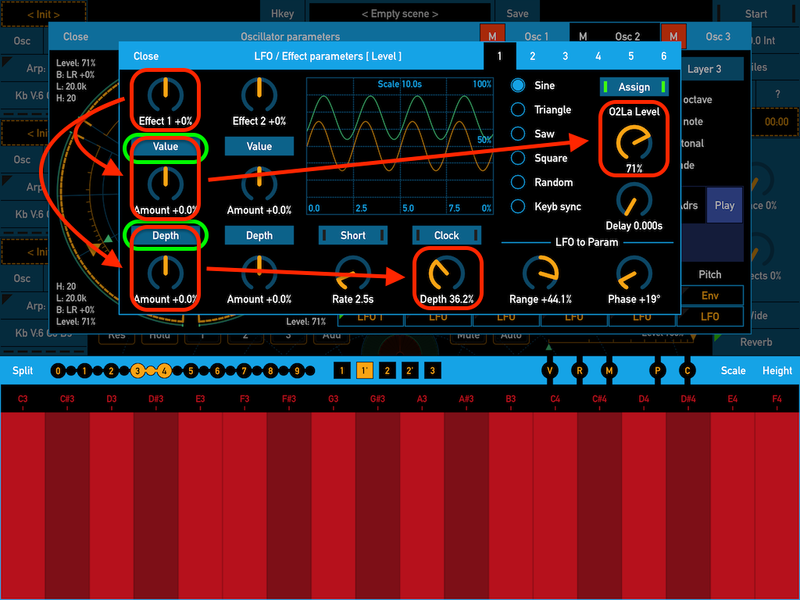 SynthScaper - Soundscapes synthesizer ver. 1.2 has been released! 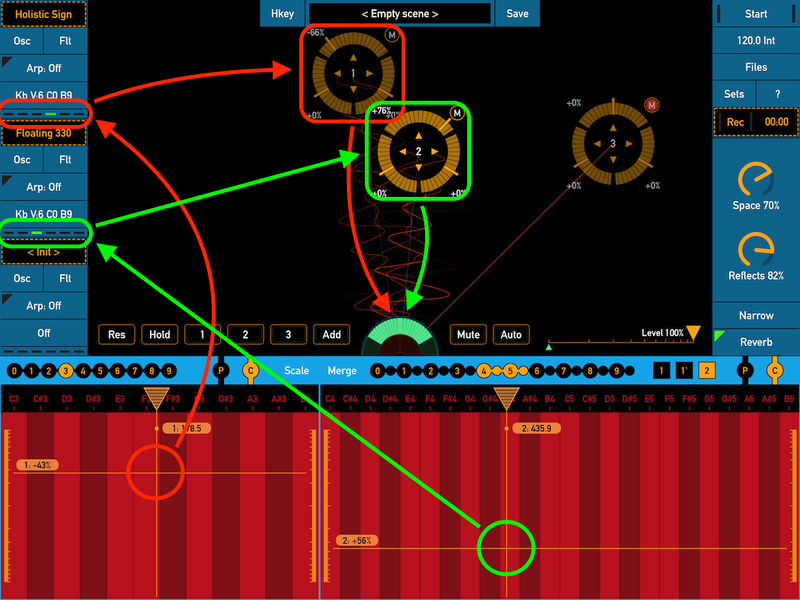 This version supports loop points and note / pitch info in wav files that gives you possibility to use a lot of ready loops from third-party samples libraries. Mode 12/24 db for LP, HP, BP filters. 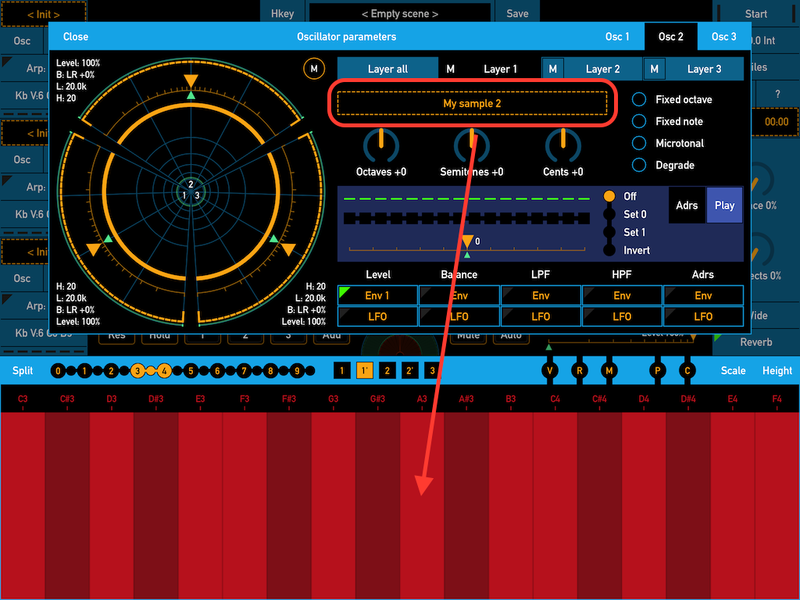 New parameter "Smooth" for Low / High pass filters. 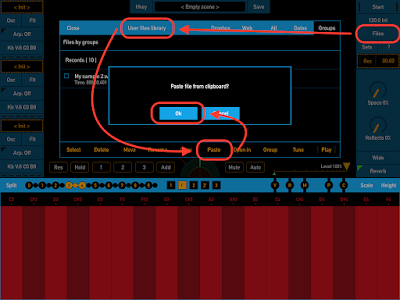 New parameter "Drive" for Band pass / stop filters. 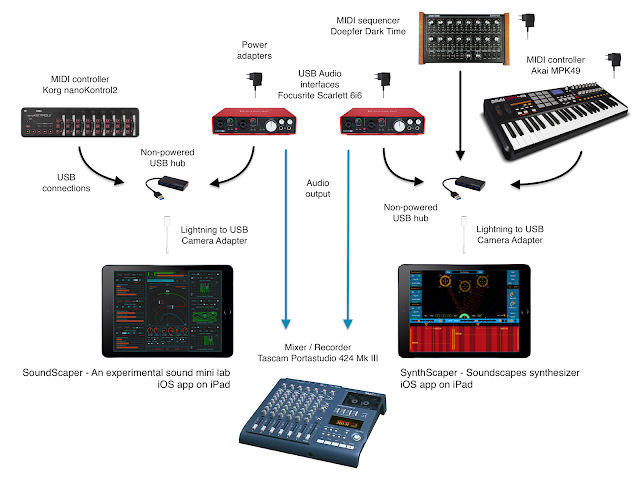 All apps of *Scaper series in one track - SynthScaper, SoundScaper and FieldScaper. 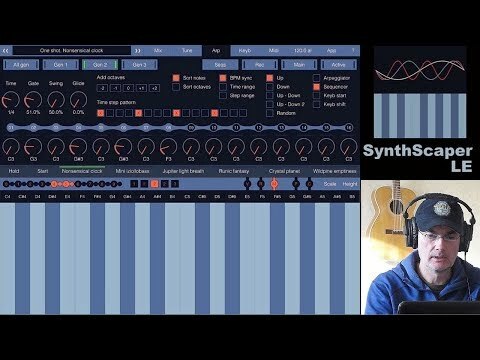 Excellent demo of sound design with SynthScaper app! 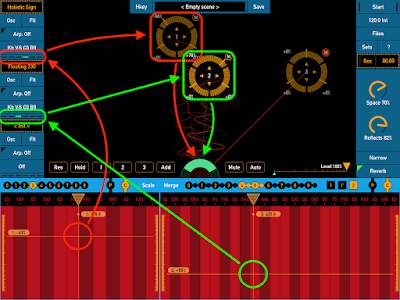 This example demonstrates how to create new scene from predefined presets with two oscillators and use split keyboard to control each oscillator separately. This is one of possible configuration for controlling oscillators from screen keyboards that is differ from default when one keyboard controls all oscillators. 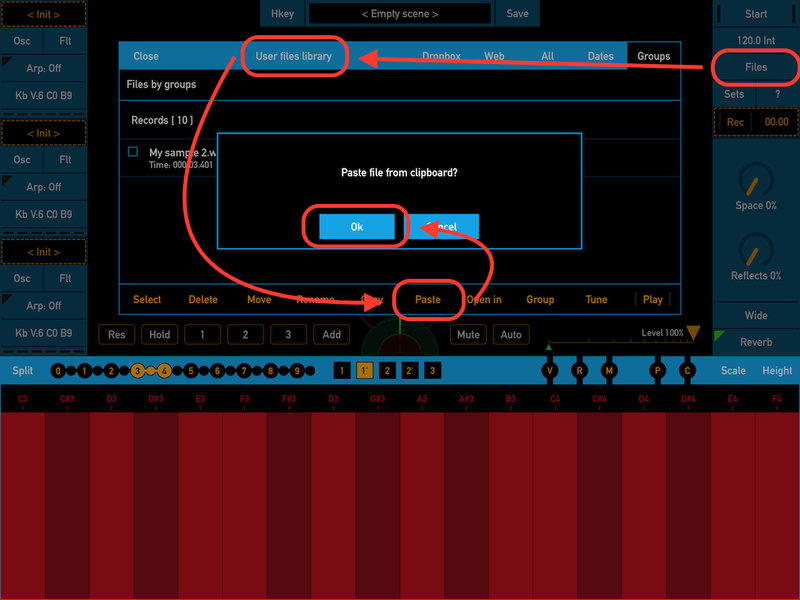 Also you can use the same way for MIDI keyboards and even configure control for different oscillators from screen and MIDI keyboards. 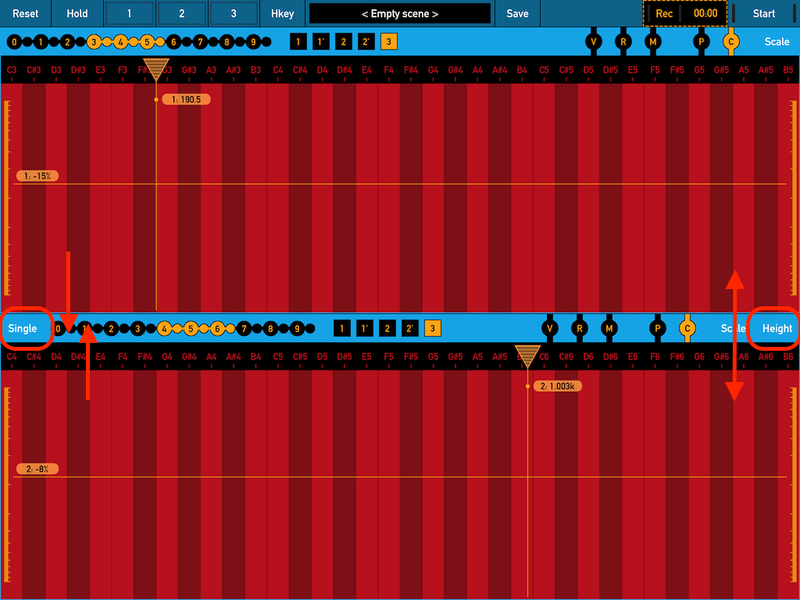 For example in this case screen keyboard can works in "Hold" mode for one oscillator and you can use MIDI keyboard for another. When you start to create new scene the best to start from "Empty scene". When the all parameters are default and main screen look like this. 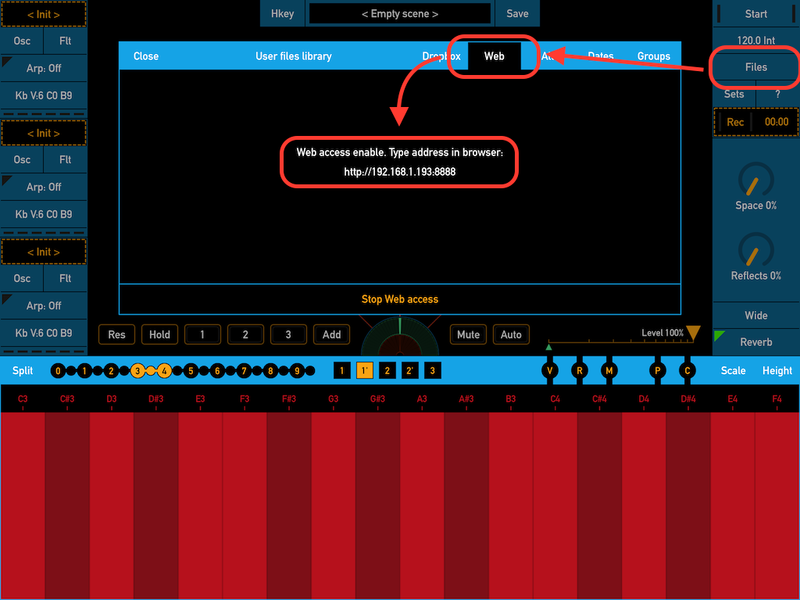 To set empty scene tap to the panel with scene name at the top of main screen. Then from scenes list select "Empty scene" and set it as current by button "Set". Empty scene is always in the begin of list. On the empty scene in the spatial mixer area set the positions of sound sources "1" and "2" at the top and near to center. Sound source it is the output signal of each oscillators (after filters and effects). Position of sound sources defines distance and side from sound source to listener. In the simple explanation this is reverberation depth and stereo balance but inside a bit more complicated. Also do not forget unmute these oscillators. For this use button "M" at the top right corner of the sound source control element. In the empty scene only second sound source is active. Next set the knobs "Space" and "Reflects" which control parameters of spatial mixer to get more ambient effect. Also set the reverb mode to "Narrow". For the screen keyboard set the maximum range and the start octave. For our example the best to use "Continuous" mode for the keyboard. This mode sets by button "C". 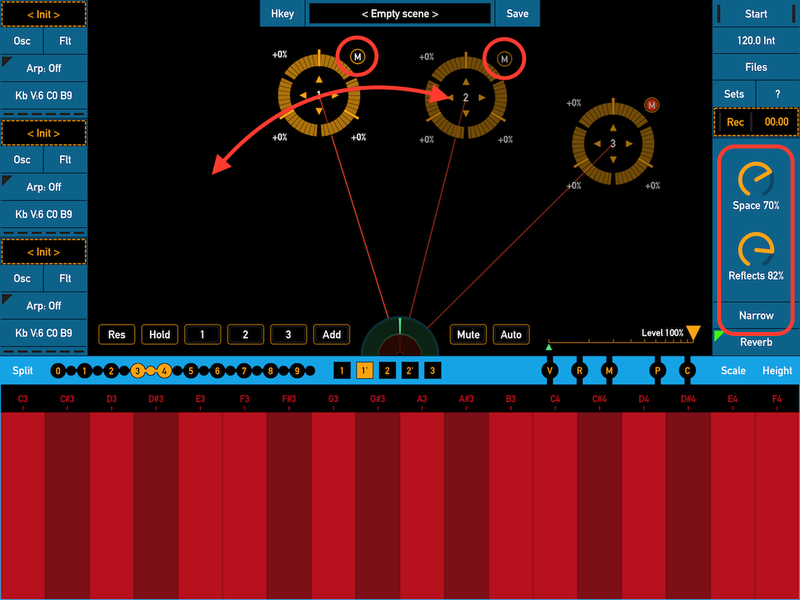 In this mode when moving across the keyboard the oscillators will smoothly change frequency instead of changing notes. Button "Split" divides the keyboard into two - "Main" at right and "Additional" at the left. Tap to this button to split the keyboard. For additional keyboard at left set octave "3" and also "Continuous" mode by button "C". You can back to single keyboard by using button "Merge". This will need when you would to set the double or full screen keyboard. Next we need to assign these keyboards to different oscillators. Left keyboard ("Additional") will control the first oscillator. Right keyboard ("Main") will control the second. Tap the button that looks like "Kb V:6 C0 B9" at the left panel for the first oscillator to open the panel "Keyboard settings". In this panel tap the tab "Keyboards". In this tab there are four buttons for assign each keyboards to the current oscillator. 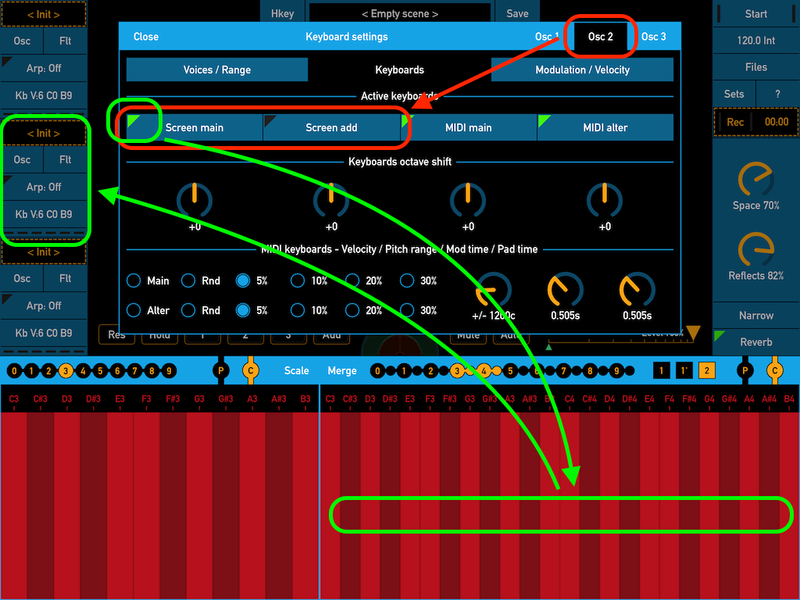 Enable "Screen add" keyboard and disable "Screen main" for the first oscillator. So all events from additional keyboard will pass only to first oscillator. At the title of this panel at right there are three buttons to select current oscillator. 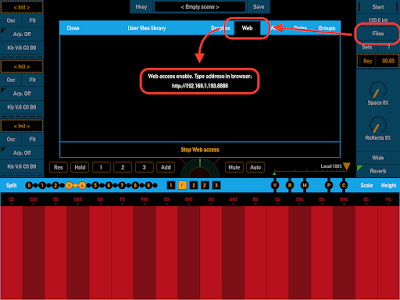 Select second oscillator and enable "Screen main" keyboard and disable "Screen add". 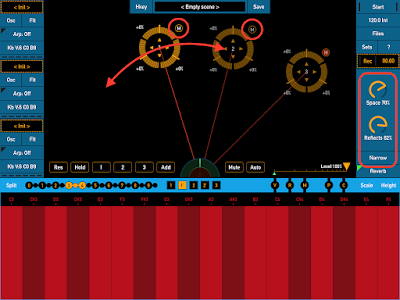 All events from main screen keyboard will pass only to the second oscillator. When you not use all oscillators in the scene it is recommended to disable unused oscillators. The disabled oscillator is not used in the audio processing. And it saves CPU resources. Mode "Mute" only mute the output of oscillator but continue processing even when events do not pass to this oscillator or samples not assigned. 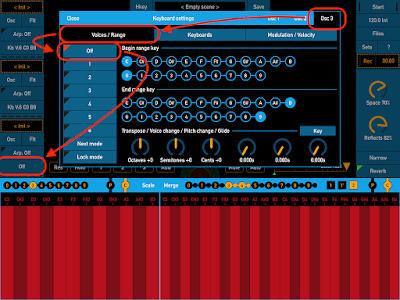 To disable the oscillator tap the button "Off" in tab "Voice / Range". Below this button there are six buttons to set number of voices for oscillator. Close this panel by the button "Close" at the top left. At the next step set the presets for these oscillators. 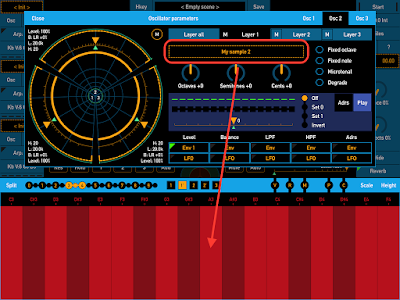 Tap on the dashed area that displays the name of preset for the first oscillator to open the panel with list of presets. By default in the empty scene preset set to "Init". 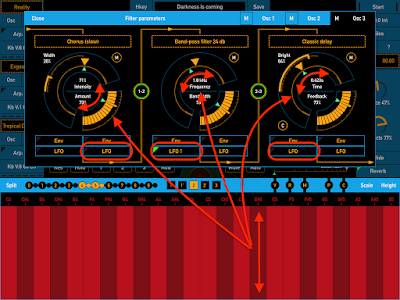 In the list of presets tap to the group "Drones", scroll the list to preset with name "Holistic sign", tap to this preset to select it and then tap button "Set" to set this preset for the first oscillator. 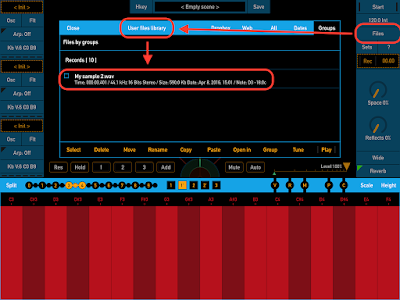 If you want to select preset from another group tap the button "Back" at right and below the title to go to the main list. Then you can select another group. 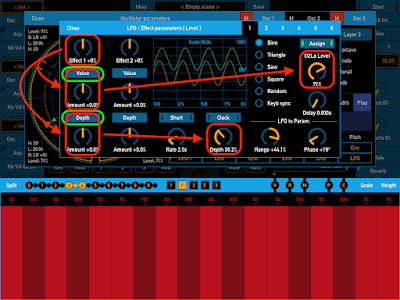 Select oscillator "2" by button in the title of panel, scroll the list of group "Drones" and select preset with name "Floating 300" for this oscillator. Name of this preset will appears in the dashed area on the panel of oscillator on the main screen. Close panel "Presets" by button "Close". 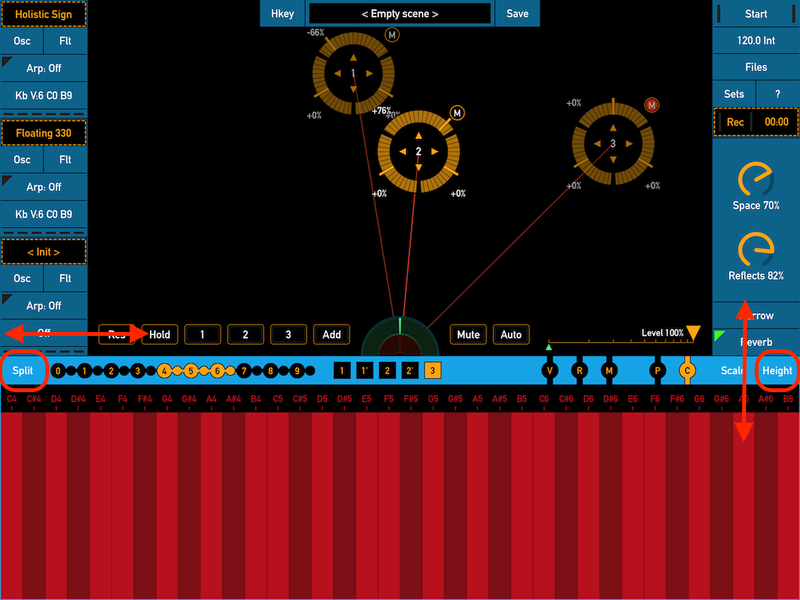 Next set the positions of the sound source "1" and "2" about as on this screenshot. The control element at the top of each sound sources sets the output level of this source. Set these elements to the values about as on this screenshot. Less level for first oscillator and more for second. 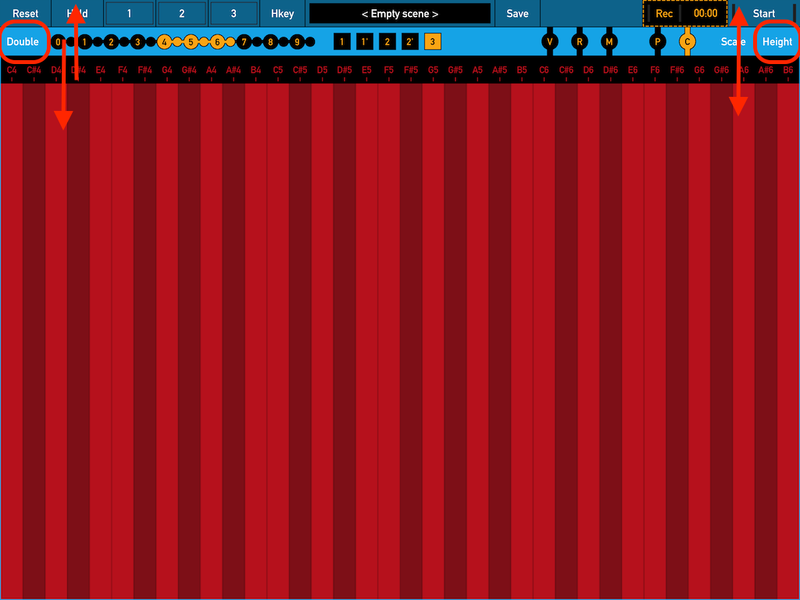 Set the range and octave for screen keyboards as on this screenshot. 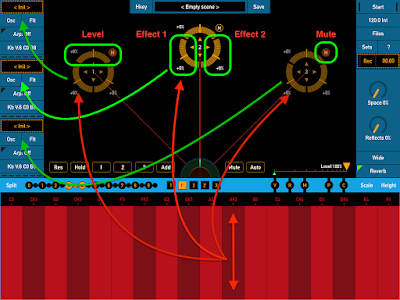 Other elements of the sound source set the value of "Effect 1" (at the left side) and "Effect 2" (at the right). More about these controls you can learn from the application description that available in this application (use button "?" on the main screen) and also available as [ single PDF file ]. 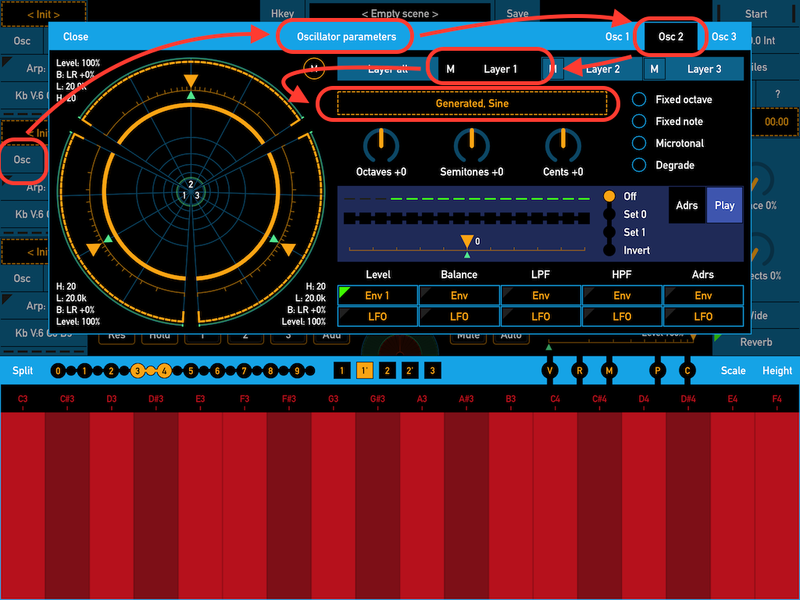 If all done correctly you can play with new scene by control two oscillators independently with main and additional keyboards. When you touch specific keyboard this starts voice of first or second oscillator. The active voices are indicate by LED markers in the oscillators panels at the main screen. With these markers you can make sure that events from keyboards (screen and MIDI) pass to oscillators. You can expand keyboard area by using double full screen keyboard. Use button "Merge" to hide additional keyboard and then button "Height" to open keyboard on full screen. On the full screen keyboard use button "Double" to open second keyboard. Keyboard at top will be additional and at bottom will be main. Double full screen keyboards give more space for control the sound but hide other controls. Use button "Height" to switch between full screen and mode when more controls are available on the screen. 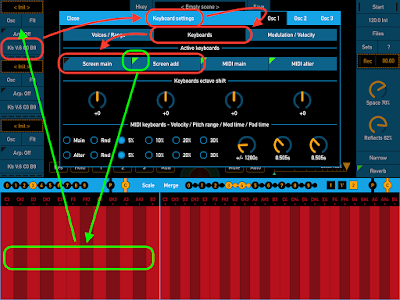 Use this example as basis you can easily construct any other scenes from predefined presets with using one or several oscillators. 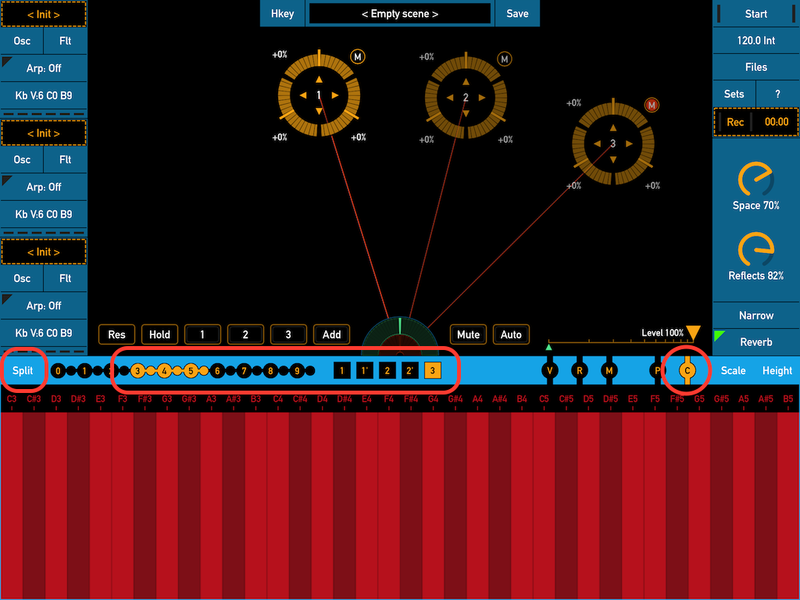 Also you can choose different ways to control oscillators from single or double keyboards. Please note if you want to use this scene in future you need save this scene as new. In the panel "Scenes" tap the button "New" to create new scene and save the current state of all parameters. It is not so difficult to create new scene with your own samples in SynthScaper. This app has many ways for downloading new samples from other apps or from desktop Mac / PC. Please note there are some limitations on format of audio files which can be used as samples for oscillators in SynthScaper. See more details at the end of this guide. 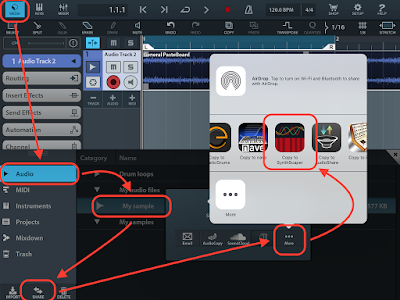 Many apps support copying samples through General Pasteboard. 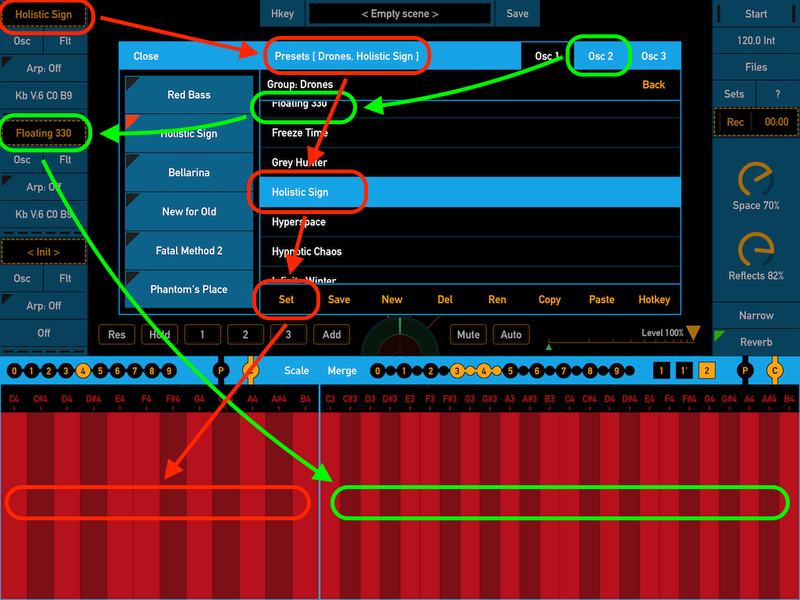 You can copy sample to the pasteboard in certain app and then paste this sample in SynthScaper. 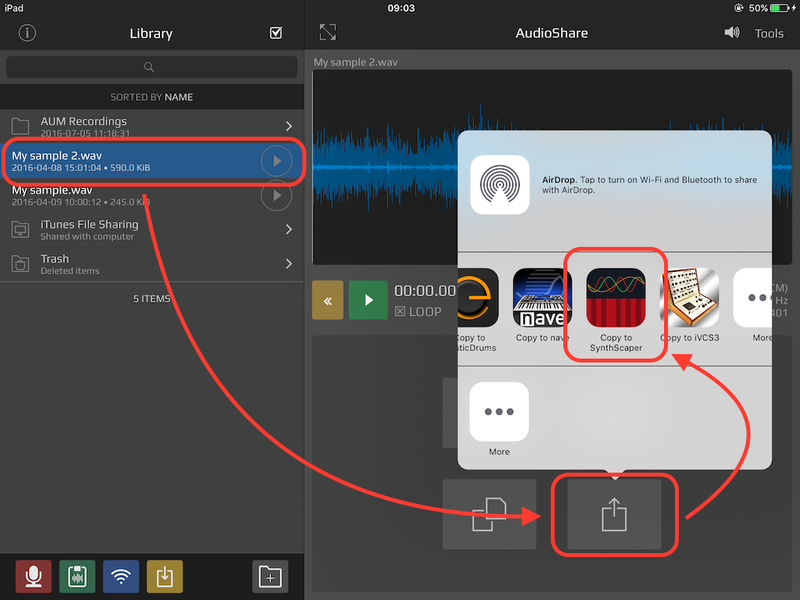 In the AudioShare app it can be done easily. 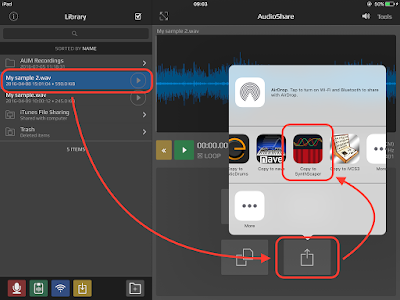 Also many apps that work with audio files support operation "Open file in other app". This operation will copy file to another app and next starts this app. 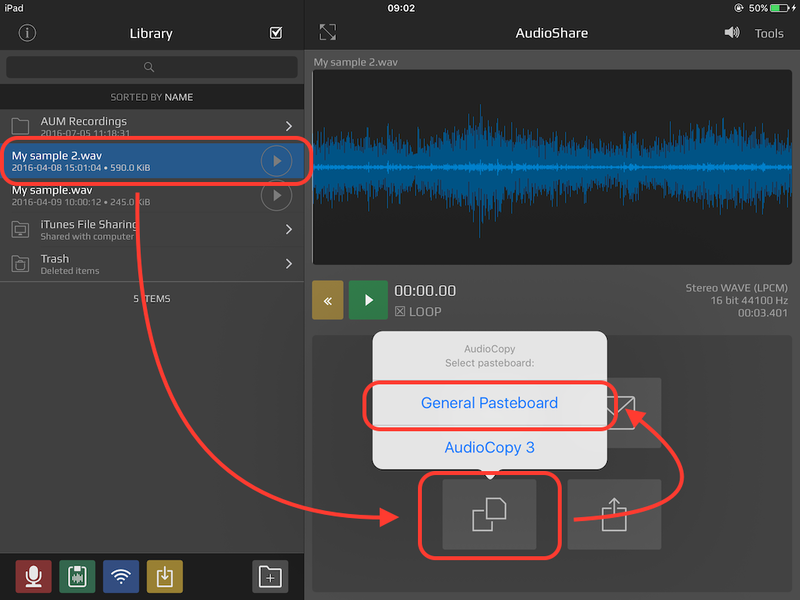 In AudioShare it is also easy. Almost all audio editors and DAWs support operation "Open file in other app". This example shows main steps in Cubasis app to done this operation. In other apps there will be other steps but almost all apps which work with audio files support operations with General Pasteboard and "Open file in ...". 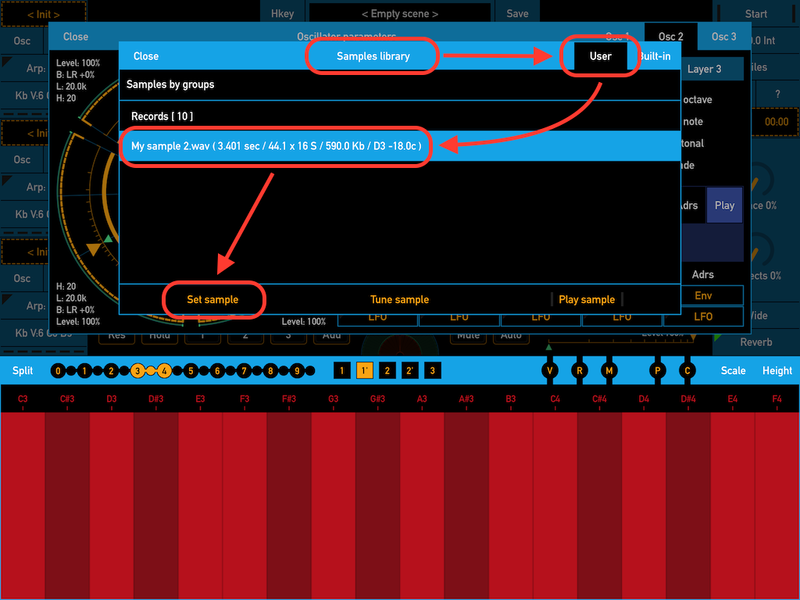 After the operation "Open in ..." is completed and SynthScaper started you can found your sample in "User files library". Tap the button "Files" on the main screen to open panel of the file manager. If you copied audio file to General Pasteboard you can paste this file in SynthScaper by use button "Paste" in the panel "User files library". Pasted files will be stored in the group "Pasted". 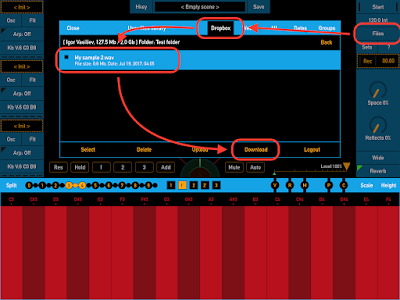 In the panel of file manager you can access all your downloaded and recorded files which contain in SynthScaper. You can exchange audio files with other devices or desktop Mac / PC through Dropbox service. 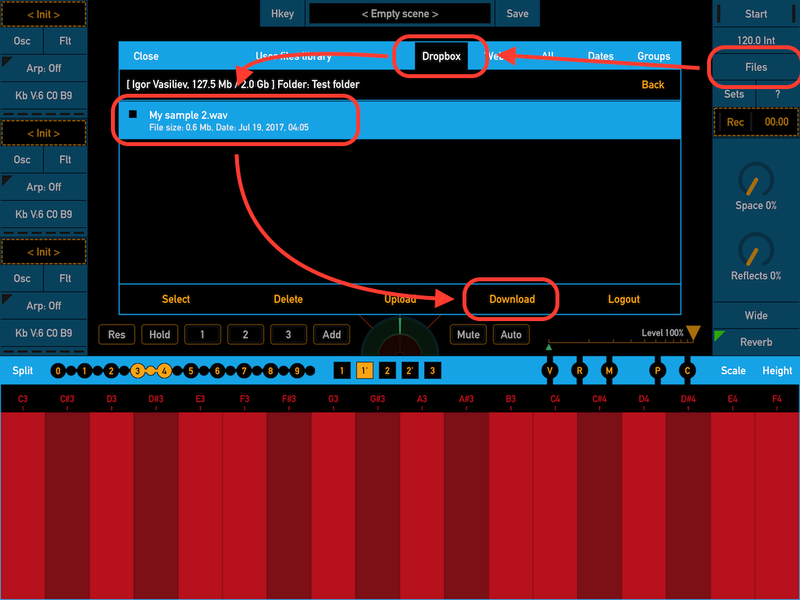 SynthScaper supports upload and download files by using Dropbox service. In the file manager panel tap the button "Dropbox" to access files in your Dropbox account. Before use Dropbox you need have an account in this service and best to have app Dropbox installed on your device. 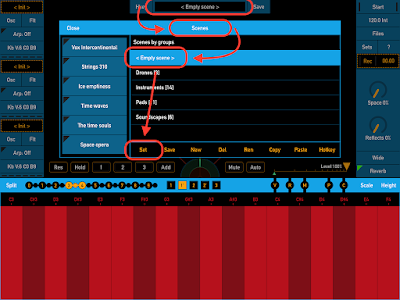 Tap to file which you want download to SynthScaper in the list of Dropbox files. Then tap button "Download". Also you can select several files to download at one time. All downloaded files will be stored in the main list or current group. 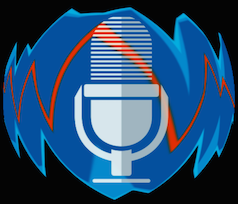 You can upload and download files to this app through any Web browser on your desktop Mac / PC in your local (home) network. For this in the panel of file manager tap on the button "Web" at the title of panel. In the center of panel will show the IP address that you need completely specify in the Web browser to access files in SynthScaper app. This service works only when "Web" mode active. When you close file manager panel or app switches to the background this service will stop. You can not access this service through the Internet or with public WiFi access point. The best way to learn SynthScaper is start from empty scene with using your own samples or samples from built-in library. 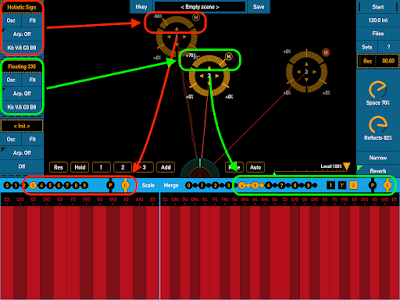 The scene contains settings of all parameters of oscillators, filters, arpeggiators, keyboards, etc. Besides scenes there are oscillators presets that contain settings of parameters only for one oscillator and its filters. At first you need set the empty scene and next set the sample in one of oscillator. Best to start from oscillator "2" when you set empty scene and initial preset because this oscillator is ready to produce the sound (tap to keyboard to hear the default sine sample). 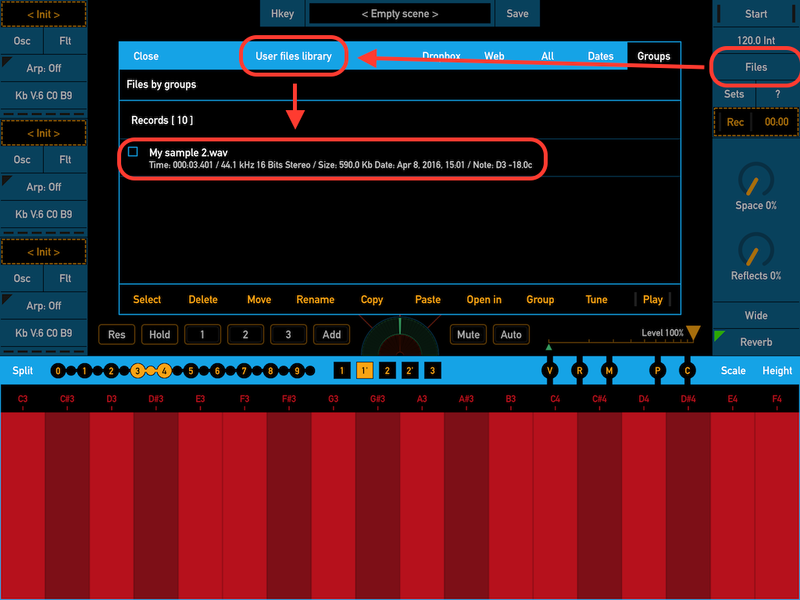 To select the scene tap on the panel with current scene name at the top of screen. The panel "Scenes" contains all available scenes organized by groups. At the top of list there is "Empty scene" with which you best to start. Tap to this scene to select it then tap the button "Set" to set this scene. Tap button "Close" to close panel. 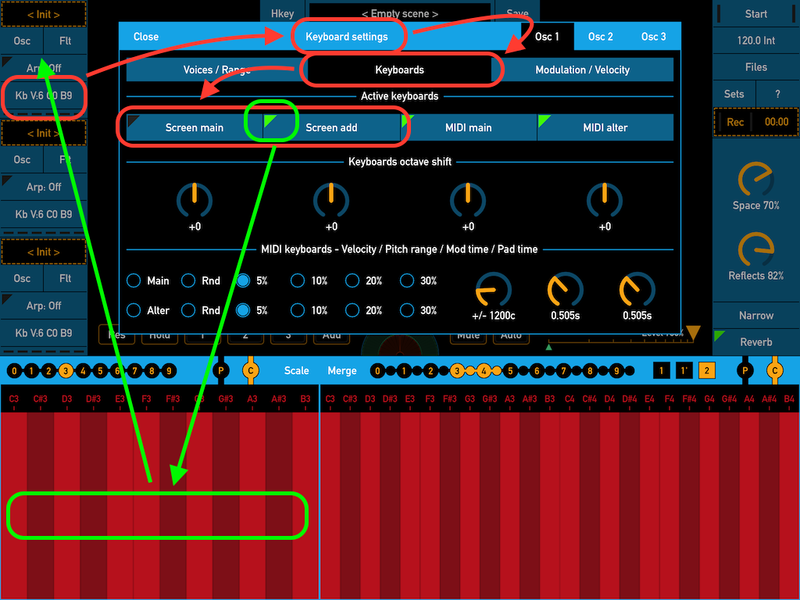 On the next step make the simple sound of oscillator with your sample. Tap the button "Osc" at middle left on the main screen to open panel with parameters of second oscillator. Also you can select the current oscillator by buttons at the title of this panel. Each oscillator consist of three layers. Each layer can have own sample but for begin select the first layer ("Layer 1"). The dashed area below shows the sample assigned for this layer. 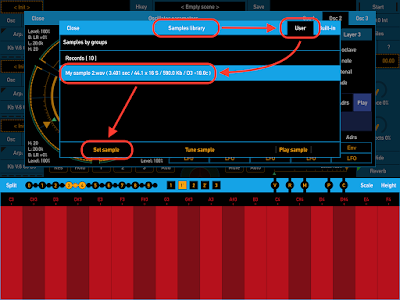 Tap to this area to open the sample library panel in which you can select sample for current layer of current oscillator. In the panel "Samples library" you can select your own sample or sample form the built-in library and then set this sample for current layer. 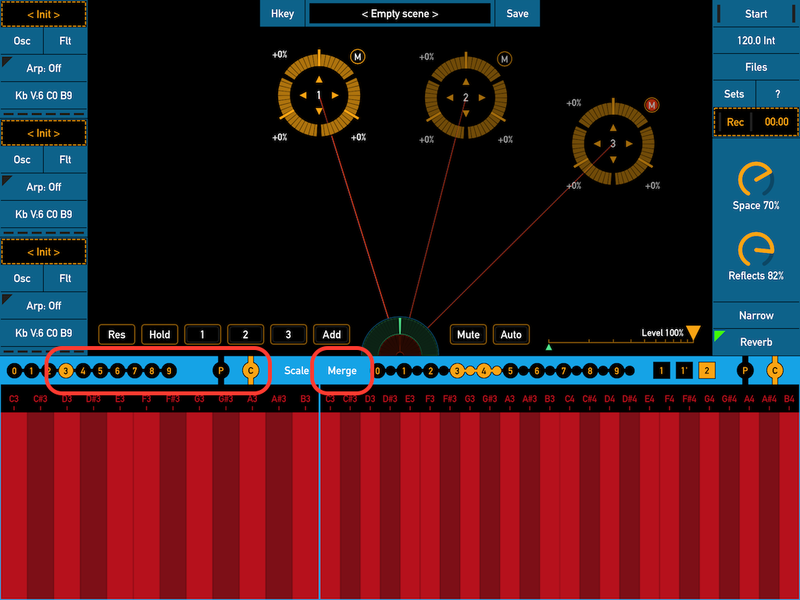 Also in this panel you can tune the base frequency (note and offset in cents) for the samples. Tap the button "User" at the title to switch on list of user samples. Then select the sample and tap the button "Set sample" to set this sample for current layer. To close panel tap the button "Close" at the left of title. If the sample was loaded completely its name will display in the dashed area. Marker "(!)" before the name indicates that sample not loaded (for example if the sample was deleted). Tap on the keyboard to play this sample. On the next steps you can set the envelope for level of this layer and then add filters and effects. SynthScaper can use a wide range of samples format: wav, aiff, mp3, mp4, m4a, aac, caf, au, snd. Sample rate of source file can be from 11025 to 96000 Hz. Bit depth can be: 8, 16, 24, 32 bits. Mono (one channel) or stereo sample in file. 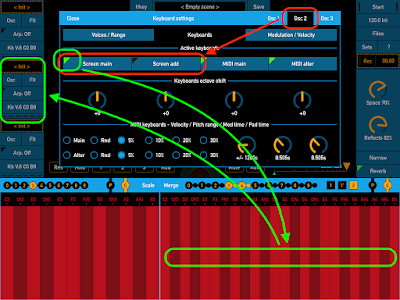 SynthScaper completely supports stereo (two channel) samples. When you use stereo sample both channels will be used in oscillator. Please note: When you use two channel sample it requires in two times more operations in oscillator than for one channel sample. Minimum time of sample is 0.010 sec. Maximum time of sample 30 sec. When on some reason sample cannot be loaded to the oscillator or its time out of range this sample will marked as "Unsupport" in the file manager. 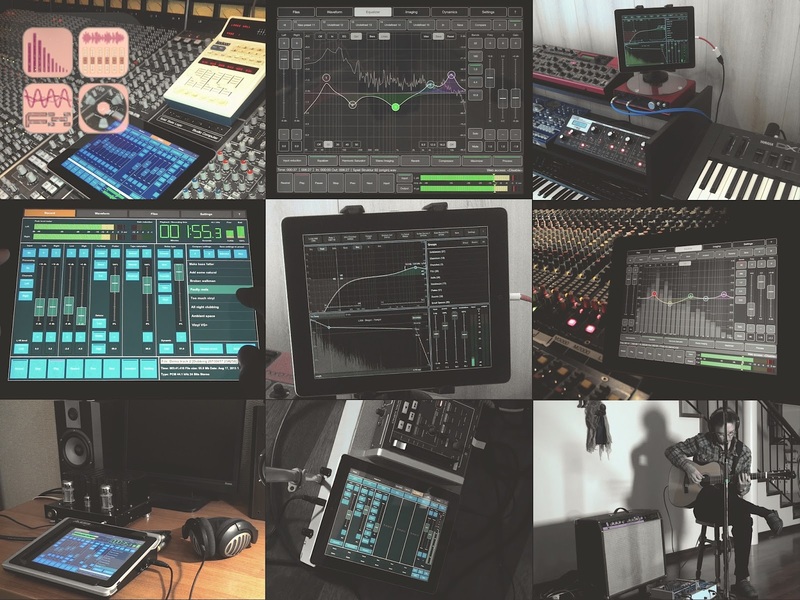 Please note: When you use too long samples for several layers and oscillators this can requires a large amount of memory which can lead to a shortage of resources for another applications working together with this.